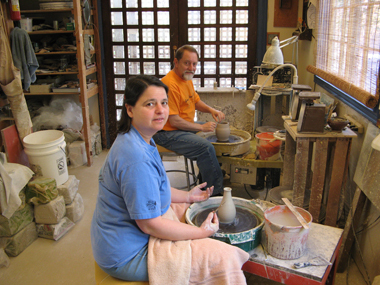 Steven's interest in clay began in 1967 while attending college. He is primarily self taught, but has had many influences from extensive travelling around the world. From 1969 -1972 he began producing professionally, teaching, designing and building kilns. After graduating from California State University at Los Angeles in 1972, Steven travelled for two years overland from England to Japan studying and working in clay. He met or stayed with some of the outstanding internationally known potters in Europe and Asia, like Michael Cardew in England and Hamada Shoji in Mashiko, Japan. In addition, his travels led him to many unknown village potters off the beaten path in Europe, the Middle East, and all over Asia. Upon his return, he moved to Santa Cruz to start a pottery business, which offered classes and rented studio space. Bonnie's encounter with clay began in 1973 while attending the State University of New York at Buffalo. She studied with Gail McCarthy, an internationally known ceramic artist. After graduation in 1975, she decided to put all of her energies into establishing a pottery studio. This was her prime motivation for moving to Santa Cruz. It was also where she met Steven, her "partner in life and clay." Since then, their work is the result of a collaboration in designing, forming, glazing and firing. They participated in the exciting Bicentennial Show in New York City, and in 1977 started showing their work at the Del Mano Gallery, L.A. and at various galleries on the East Coast. Today they have their work throughout the world. During 1976, Steven and Bonnie became founding members of the cooperative Center Street Gallery, at the former Art Center in Santa Cruz, where they exhibited their work until 1985. In 1983, their show at the gallery entitled "New Directions in Ceramics", brought an expansion of their work into larger, more sculptural forms. At the beginning of 1985, they traveled for seven months to Japan, Taiwan, Hong Kong, Thailand, Nepal, India, Israel, Greece, Italy, France, Holland, Belgium and England. Their travels were documented with slides and recorded interviews. When they interviewed potters, they shared thoughts and feelings on what it means to be potters in society today. This common bond of clay provided a focus and many wonderful experiences during their travels. Museums in each country provided rich research experiences and local galleries gave them opportunities to view contemporary work. In 1986, they participated in the International Ceramics Exhibition in Mino, Japan. During that year, their interest in combining metal with clay inspired Steven to take a bronze casting course, and Bonnie to study small metal fabricating. Since 1987, they have taken part in the Open Studio, sponsored by the Cultural Council of Santa Cruz County. The idea of the Open Studio is to assist artists in marketing their work by creating an opportunity for the community to visit artists' studios. The Open Studio is a natural extension of the Barisof's concept of being "community potters". From the spring of 1988 to the summer of 1989, they were invited to fire special pieces in a Noborigama (a Japanese style climbing hill kiln). Using wood to fire the kiln imparts a very distinctive and unique look to the clay. This provided an arena to experiment with new forms and designs, opening up an entirely new world. This new body of work was presented at a special showing in July, 1989, and was very well received. 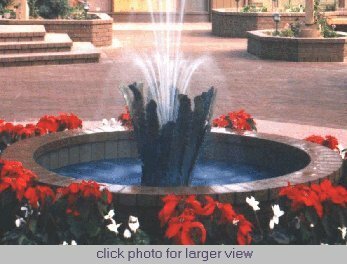 In the Spring of 1989, Steven was commissioned to design and create a bronze sculpture for a fountain. It is the focal point in the interior pavilion of Little House, a Senior Community Center in Menlo Park, California. The sculpture was installed and had a dedication ceremony in December, 1989. In 1990, the Barisofs had a solo exhibition of their work at the MOA Art Gallery in Los Angeles. The show included over 100 pieces, using various firing techniques: Raku, wood-fire, salt glaze and gas reduction - to achieve a broad range of surfaces, textures and color. During the summer of 1993, Steven and Bonnie built their "dream studio", which is primarily their glazing and hand-building workspace. The space has been carefully designed to promote efficiency and enables them to give workshops as well as teach individuals.